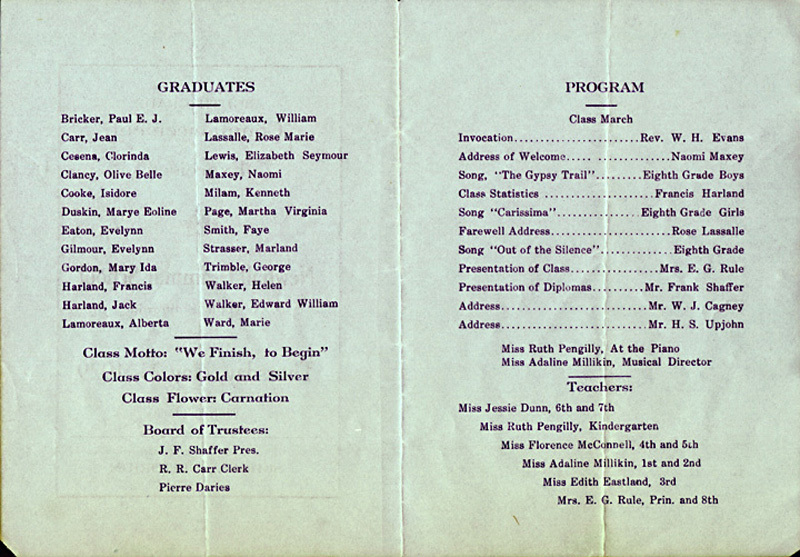 Commencement program for the first graduating class from the fourth Newhall Elementary School building, which opened in 1928 at Walnut and 11th streets. It burned down on Valentine's Day, 1939, and was rebuilt in the same location. Dark blue ink on light olive-green stock. 5.75" x 8.5", folded in half to 4.25" x 5.75". Back cover blank. Class Motto: "We Finish, to Begin"
Courtesy of Dorothy Kewis Kupcha. KU2902b: 9600 dpi jpeg from copy print.